3 . 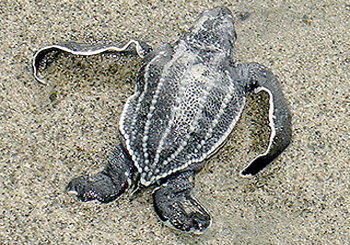 To facilitate a significant reversal in the population decline from the largest leatherback turtle nesting beaches in the Pacific, Irian Jaya, Indonesia, by increasing the number of hatchlings which hatch, make it to the sea, and return to nest; thereby providing longevity to the species. Save Our Leatherbacks Operation (S.O.L.O.) is a certified IRS 501(c)(3) nonprofit charity foundation and a registered Texas environmental nonprofit corporation. The primary goal of this Foundation is the help reverse the rapid decline of the Leatherback sea turtle, Dermochelys coriacea, populations toward extinction, which is occurring at an alarmingly fast rate. Our specific goal to help achieve a significant reversal of population decline in the the largest leatherback turtle nesting beaches in the Pacific, Irian Jaya, Indonesia, to increase the number of hatchlings. This will help them survive beach threats and return to the nesting areas in greater numbers as they mature to lay more eggs. When compared to all environmental damage done to our planet, the threat of extinction of the Leatherback sea turtle is far more serious and far reaching than most people realize. Their decline is resulting in a domino effect that includes loss of our ocean fish stocks. If Leatherbacks go extinct, the damage to marine ecosystems would be irreparable. To save the Leatherbacks from extinction, extensive work on the beaches and with the nearby villages is required. In addition, the help of communities, their work forces, and the public forum will be required to prevent government policies from allowing commercial fishing to resume in currently protected marine parks off both the Atlantic and Pacific Coasts of America. The government agency in charge of our ocean (NOAA) is charged under several laws in the USA to strive for and manage a balance of commercial fishing and the protection of our sensitive marine ecology. Unfortunately, commercial interests interfere with maintaining this balance. They speak loudly with their money and tilt the scales in their favor. Marine life, such as the leatherback turtle, forages off the US coast for up to 4 months a year in protected marine parks. They have no voice. Our goal is to speak for these leatherbacks (in partnership with other environmental organizations) to strive for the balance between fisheries and the ecosystem. We envision a balance where commercial fishing and our ocean environment can co-exist. 1. Consult with qualified researchers about the current numbers of hatchlings that perish before they reach the sea after hatching. 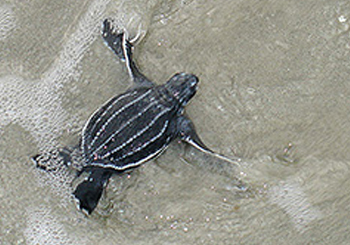 (Approximately 15 to 20% of the hatchlings are currently affected). 2. Develop a village-friendly means of protecting the nests from local and jungle predators until hatching (about 8 weeks). 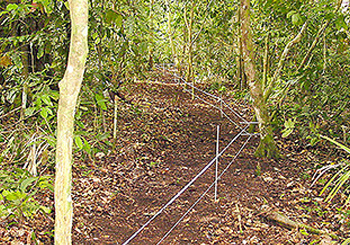 The small protective fences used on Sipidan Island in Borneo and /or covered jungle mats over nest locations will be tested. 3. During the nesting season daily beach patrols will be conducted to inspect nests that have hatched. The nests will be inspected to uncover hatchlings that have not yet climbed out of the foot deep nest to set them on the path to the sea. Eggs that did not hatch will be examined and a database of problems with unhatched eggs will be developed. 4. 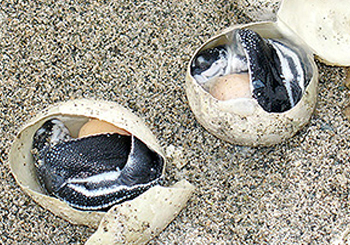 Expand the experimental relocation of eggs laid in beach regions that suffer from increased temperatures that cause the eggs to cook in their shells and/or drowning in areas where sea levels are rising. The at-risk eggs will be relocated to more viable areas. 5. Expand on the beach night patrols (with use of S.O.L.O. provided new work boat) for more beach protection of nests from poachers and predators and to mark more nests. 6. 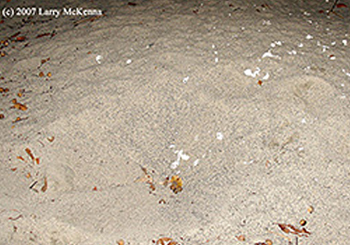 Increase the database of turtle hatch outs and the numbers of nests made each season. 7. Continue and expand S.O.L.O. interactions and life improvements within the village. These actions will include but not be limited to improving sanitation, bringing a source of potable water from mountain streams, expanding assistance to school children in the form of uniforms, shoes and textbooks, providing hands-on training to the women of the village for sewing and making handicrafts that can be sold to tourists for income. We will supply medicine and equipment in collaboration with the Indonesian Green Cross, and we will encourage the Indonesian government to supply a trained nurse or midwife to the village. Ministries of Central Government will be encouraged to supply on site education on farming/irrigation practices and the raising of chickens and/or ducks for food and to sell to a local market for income. Part of our mission addresses the need to educate, inform and train the general public in the USA and internationally about the extreme plight of leatherbacks and its direct impact on seafood supplies. The implinks of people are not aware of the plight of this giant turtle nor are they aware of its direct relevance to the symbiotic balance of marine life. Our public awareness campaign includes presentations to groups and individuals at any location where we can meet and discuss the issues. We also plan to expand our press articles and press releases in international conservation magazines. S.O.L.O. has initiated a Leatherback Turtle Newsletter, planned for either quarterly or semi annual release. The first issue was printed October 31, 2007. Wherever we can, we will become proactive in support of the survival of leatherback turtles along USA coasts when the commercial fishing interests attempt to reverse laws protecting ocean marine parks. Because leatherbacks are caught by longlines and driftnets as bycatch, we need to ensure that a balanced approach to commercial fishing, as mandated by US laws, are kept in place and enforced. As part of our education initiative, we plan to initiate school education projects at grade and middle school levels (our "Leatherback Kids" program). We have established contact with schools in the USA, Canada, Singapore and Indonesia to further this education and awareness. This will be an ongoing effort and a challenge. Education in a different dimension will take place within the Papuan village adjacent to the 18 km long nesting beach. We must ensure that these communities understand the importance of conservation, which will affect their well being as well as the well being of leatherback populations and the marine ecosystem. It is most important to highlight the necessity to provide life improvements for the peoples of these remote villages. No meaningful results will occur there without their active support and participation. The head clan of the village owns the traditional rights to the leatherback nesting beaches and all jungles behind. Their permissions are required to access the beach for simple tourist visits and or applied research. The sustainable protection of leatherbacks will be accomplished by the residents — not by foreigners who visit for a few days each season. With the exception of S.O.L.O., no outside researchers who have visited Papua Barat have provided assistance to these remote people. Our objective is to equip them with the skills necessary to protect the turtles and their eggs through hands-on onsite training and then to assist them in protection activities. At each juncture of turtle protection the communities will be encouraged that their living conditions will be improved as long as they continue to protect and not exploit the turtles.